The CryptoCape is the BeagleBone’s first dedicated security daughterboard. Known as “shields” on other platforms, a BeagleBone cape attaches to the expansion headers of the BeagleBone. 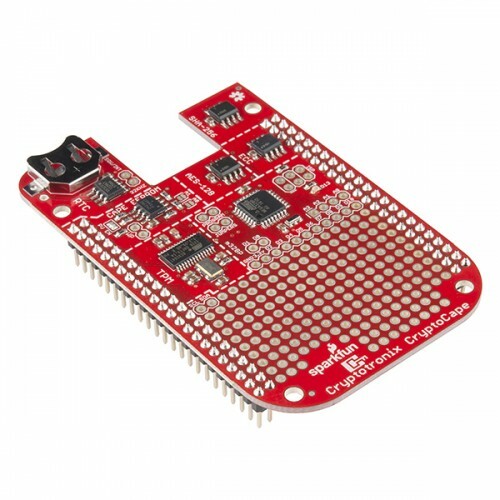 This cape adds specialized ICs that perform various cryptographic operations which will allow you to add a hardware security layer to your BeagleBone project. It also is a nice device for those performing embedded security research. Needless to say this is a great product for those of you who are interested in computer security! Each CryptoCape comes with pre-soldered headers making this board ready to be attached to your BeagleBone as soon as you get it. The only additional item you will need to get the CryptoCape fully functional is a CR1225 coin cell battery available in any local shop. The CryptoCape is a registered BeagleBone cape whose firmware is included in the latest BeagleBone debian images. However, you may need to upgrade your image to retrieve the latest software.